As the newbie entrepreneur who was all alone for a long time, I had hard time relying on other people. But with the rate MyBlogGuest has been growing, I had no other choice… And the team has turned out to be my biggest accomplishment… The power is in people! It all started about 5 years ago when I thought guest blogging was cool enough to deserve its own community. It took me about 2 years to go from dreaming to actually acting..
That’s when my brother offered his help and started building what I was describing. We made a great team but the site grew so fast that we were not enough to maintain it. 1) What brought you to guest blogging? 2) What brought you to MyBlogGuest? That might sound weird, but I was brought to guest blogging by MyBlogGuest. With MBG I’ve learned what guest blogging is, what it is for, and how it works. 3) How did you become part of the team? Ann Smarty invited me join the the team in April, 2011. I quit the job in a big company (it no longer exists btw) for a smaller one as it seemed at first. But indeed that was for something a lot bigger and more important. 4) What’s your working routine? There is a saying that good service is invisible… So, my daily routine is to do my best to stay invisible. Despite being a part of some other projects and taking care of organizational issues I handle most of customer support at the forum. We get dozens of questions, requests, suggestions, etc. everyday. MyBlogGuest never sleeps 🙂 And that’s good because it means people are active. We appreciate all ideas on how to make the forum a better place for all of us. 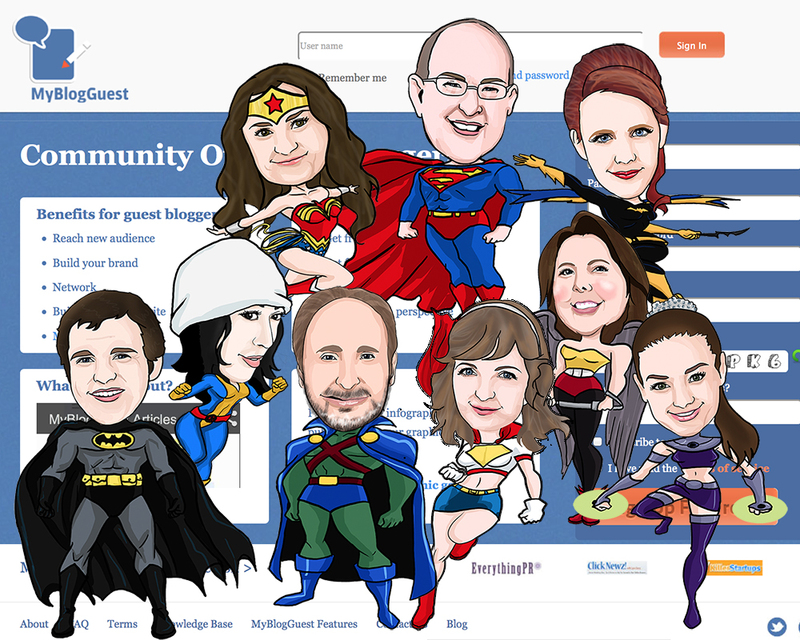 5) What do you recommend new members of MyBlogGuest? The hardest thing is to make people realize that it’s impossible to get to know everything in one day from one letter or a blog post. It’s a lot more than that. I was running a broad-interest website at the time that needed a large number of posts. Guest posts filled the gaps in my posting schedule. I signed up about a year before I actually started to use the site, after searching for “guest posting”. The other sites I found were all about spinning articles. MyBlogGuest was the only ethically-based site I found. I hunted through the gallery for posts for my site and whenever I found something significantly out of kilter in an article I would email Ann Smarty. Ann then sent me an email offering me a moderator’s job, going through the Article Gallery. The job has grown along with MyBlogGuest and now takes up 5-6 hours a day, 7 days a week. I get up at 4am and start work straight away, check all my emails, including MBG ones where articles have been refused by publishers. I try to fit in work on my own site, TimeMoneyProblem.com as well. This is a site I have only started recently and is designed to help people to make an income if they have lost their jobs. I cover real world and online ideas and the central message is that you need to invest your time in growing your knowledge, then to develop your reputation and relationships before you even start thinking about earning money. In between all that I work on editing articles for other people! As a publisher your ability to attract good writers depends on your reputation. As a writer your ability to attract good publishers depends on your reputation. I guess you could say I’ve been guest blogging since before blogging came on the scene. I used to write a column and articles for others’ web sites and guest blogging was a natural transition within my writing career. I kept sending PM (private messages) to Ann about how beneficial a Twitter Chat would be to build a MyBlogGuest community. She not only took me up on it, but became an expert on Twitter Chats herself, writing articles for Social Media Examiner and Mashable, on the topic of Twitter Chats! Ann brought me on board as the Community Building Strategist and we have since added Google Hangouts and Podcasts to that list of community building activities. My routine varies. I am very checklist-oriented, but I also love challenges and multi-tasking. For MyBlogGuest, I spend time daily, tweeting, posting to social media, and responding to PMs. A big concentration of my time is spent with the hosting and production of the monthly hangouts and now the semimonthly podcasts. I block out time just for MyBlogGuest, at the end of each month, so that we can produce a quality presentation, one that is deserving of the quality community and team that MBG represents. I recommend that new members get involved in the MBG forums and/or the new G+ community (headed up by our newest member, Don Sturgill). There can be many questions that may come into your head and though the answers are there, they may not be readily seen. We have wonderful people on the MBG team and that team is there to point you in the right direction. Ann has written many informative, detailed, step-by-step instructional blog posts on the MyBlogGuest blog, so come ask us and we can give you a link to more information to help answer any questions you may have about MyBlogGuest. And, by all means, hang out with us at G+ and the hangout on the last Friday of every month (11a EST/EDT). Ann’s brilliance motivates the team, and It is because of you, our community, that we are here. My employer, having been hit hard by adjustments to Google’s search algorithm, decided to sprinkle some white hat SEO on the situation. As the copywriter with the most internet experience, I was moved from marketing to the SEO team. At first, our database guy looked for places to publish my work. He was horrible at it. Once we tried My Blog Guest, it was obvious Ann and her team were the perfect partners. I wrote the articles, uploaded them to MBG, and turned back to writing – letting the MBG website do the hard work of connecting to publishers. It’s a long story, but here’s the nutshell version: I met a billionaire at a remote airstrip in Utah’s canyon country. He liked the work I was doing with a business incubator there and invited me to go to work for him. I had hopes of taking a program I had written for the incubator – The Roadmap to Freedom – to a multinational corporate level. Instead, I found myself in the confines of a cube farm, adhering to a dress code, writing hype for marketing, and saying, “Yes sir!” a lot. I’m not cut out for that life. I love lean, mean startups and the excitement of taking a risk and doing something different, of investing my time in something absolutely helpful and valuable. Ann Smarty saw my plight and offered a hand up from the mire, saying “There’s a spot for you on my team, if you want.” Ann has been my (unbeknownst to her) mentor for over a year. There is no better place for me, right now, than helping out with My Blog Guest and learning the ropes of Guest Blogging from her and the MBG Team. It is insanity. I am driven: up hours before daylight; usually still working past midnight, constantly moving forward. My saving grace is the Roadmap to Freedom program—it keeps my priorities before me always, and allows me to keep my mind focused. I’m a family man, with children still at home, so I must pull away from work projects and give them my full attention every day. My most pressing current challenge is learning to slow down and be there for them, for me, and for you. Tom Merton said, “Don’t just do something, stand there.” That statement is beginning to make a whole lot of sense. My paraphrase is, “You can’t save time, you can only wait for it.” I have discovered prayer and meditation to be the two most powerful actions I can ever take. Sometimes, we have to slow down in order to catch up. 5) What do you recommend for new members of MyBlogGuest? To get the most from MBG, one must step back and look at the entire picture. The resources on the main site, as well as the auxiliary services (The MBG Blog, Twitter Chats, Google+ Community, YouTube Channel, and such), are absolutely amazing. Much of the capability of My Blog Guest goes all but untapped. I guess it’s that way with life in general—we access but a small portion of our potential. Ann asked me to develop some tools to help MBG users better take advantage of the service – and that is something I am super-excited to do. Ann says the main idea behind My Blog Guest is to provide a place where people can get connected. I like that concept. If there is one thing I’ve learned in life, it is that we need one another … yes, we do. I had lots of plans to start guest blogging, but I never actually got started. I still have plans though. I came to MBG as a publisher seeking quality content, actually. I found the community quite active and saw the value of what was there immediately. I signed up as a PRO member right away. I’d known of Ann from many years back and knew that anything she associated herself with was going to be quality stuff. This gave me a lot of confidence in the value of what MBG had to offer. So, being the chatty gal that I am, I started participating in the forums. The environment is encouraging and helpful, with prompt answers from staff and other members. Meanwhile, I got to continue to enjoy SEO and blogging like I used to when working professionally in the industry. Ann sent me a PM and asked me if I would be interested in helping moderate the site and forums? To which I said yes please! I really love helping people. With my SEO background, helping out MBG members is a perfect fit for me. My typical day begins reading email, the MBG forums and the MBG G+ community, answering where needed. Then I start working on the article Gallery. I spend a most of my time there sending authors brief private notes to help them improve their articles or correct minor issues that may be against the MBG guidelines. Throughout the day, MBG staff corresponds with each other to help MBG members and each other. There is a wide variety of experience here. Everyone has been very professional and a pleasure to work with. It’s a fantastic team! When you are a new member of MBG, you should familiarize yourself with the site. Depending on whether you are a publisher, or an author, and whether you are using a free or paid account, you will be interested in different things. Free member authors will need to use both the forum and the site search feature to find potential publishers. Then contact the site owner through the MBG system to offer their articles. Free member publishers with the free MBG WP plugin installed can browse for articles via their own WordPress admin area and make offers directly through the plugin. Great feature! Or they can view the article Gallery on the MBG site and make an offer to publish on their own site that way. Only paid member accounts can submit their articles to the Gallery and offer their articles directly to MBG publishing member sites (that are using the MBG WP Plugin). So as a free member, you can see and use all the site features. Being a paid member makes using those features far easier. Lastly, some members may not be aware of the MBG G+ community yet. We have focus topics every week and are always available to ask questions you may have about Mg’s features or anything about guest blogging, site design, SEO etc. Last August happened to be another crossroad for me. We all have some beliefs about the time flow and our wander through it, we set (with the help of society) a kind of milestones and deadlines for ourselves, by when and what we should achieve in our lives. In case we succeed – we are fine, but when we don’t..
Guestblogging started for me from MyBlogGuest namely. I was lucky enough that Ann invited me to become a part of the team from the very start. And having changed quite a few far various jobs and positions I may claim that this is the greatest team I have an honour to work with and be a part of, and I admire Ann’s manager talent. Working routine.. It’s so various that it’s hardly a routine, but anyway.. I’m in several Ann’s project besides MBG. Smartphotostock. Our newest one, fresh brewed and served 😉 Best example for me, that you should never be afraid of trying something new, and there’s always just one step from an idea to its realisation. But this step requires an action, so make it and see the result. MyBlogGuest is my hobby 😀 and my full-time job. It’s my pleasure to be an administrator here. I like welcoming new users and helping them finding their ways around and verifying new blogs. I’m always there for you if you need any social love and shares for your published articles. I have never thought that I can be such a social person – thanks to Ann now I know 🙂 I’m glad choosing new and awesome featured authors and blogs for you. What I would recommend to new members.. Since in a way I’m a newbie myself, I would say, never afraid to ask. We are here just for you, we are with you almost 24/7 and always open and ready to help. I was running about a dozen websites. They were growing, but growing slowly, because I worked on everything alone from content, to programming and marketing. I find myself more into creating, developing, and promoting websites and I only write when I’m inspired. That’s how I found MBG. I signed up for its free program, and looked for articles in its Articles Gallery for my blogs. This means I am no longer working alone. I have found people who contribute to my blogs for free. As a fountain of ideas, I gave suggestions to Ann Smarty. Since I’m good at writing, I already started to add notes to articles in the Gallery before I became a moderator. Because what I was doing was exactly what a moderator is supposed to do, I naturally became a part of team without any need for training. After that, all my fountain of ideas about guest blogging and MBG mushroomed, including an emphasis on the technical approach. The great thing about Ann Smarty is that she brings people together; she takes action, and I learned from her how images make articles so beautiful, hehe. I have to deal with emails and MBG’s inbox every day from morning, answering all the questions, solving all the issues, responding to inquiries in MBG forums. I add complex issues to my to-do folder and mark them, will deal with them later one by one through the day. Our moderators reside in different time zones. I usually start to moderate articles when my fellow European colleagues are sleeping. So MBG never sleeps. I spend the rest of my time working on my websites. What blogging tips could you offer our audience? A blog is an investment, even if it’s cheap nowadays, because it’s your time, and your time is expensive. So when you decide to invest your time on your blog, you have to be focused; you have to focus your energy on limited blogs, until at least one succeeds, because you only have limited time and energy. The reason a blog is more successful than others is that the blogger concentrates on the blog; he spends more time and energy on the blog than others. Even though I have 20 websites to take care of now, I only had one at the beginning until I learned all the necessary skills from it and it also led to my 2nd website 3 years later. So from my 2nd website, the rest is not from scratch, and it took 3 years part time for me to reach that point. Focus on a niche, not all in one type. It’s the niche, and your passion for that niche that makes your blog stand out. One of my writers said something that touched me. He said, I want to create a foundation as someone who started writing with his favorite things and branched out from there. Your 1st blog is your foundation; only when it succeeds, you can then branch out from it. So it has to be your passionate niche. Take an online writing course that’s related to your writing genre if possible; it’s your asset. There’s a saying, you cannot find love; love finds you. It also applies to the people you can work with, no matter if they’re your employees, contractors, partners or boss. I had been working alone for years, but I no longer work alone now. I have passionate people who assist me, passionate writers who write for my blogs, expert partners who partner with me, and a great boss who indulges my ideas. This all happened when I started to join MBG and network with others. I didn’t look for them; they came to me. But I do give myself a chance to let others know me and get to know them at the same time. If you can, then partner with someone who’s good at marketing, so you can concentrate on writing. Vice versa. If you’re good at marketing, partner with someone who’s passionate about writing. But, remember, you cannot find them; they find you. And until then, be prepared and get ready. Working with selected others is much better than working alone or working with unselected ones. Any tips for our audience based on your role as a MBG moderator? You should be an expert or hire an expert to write articles, because readers want to read expert articles, but not laymen’s. An English literature writer may not beat a teenager when writing about video games if the writer never plays a video game or the game he played was out of date. I admit that a skillful professional writer is able to write good articles effortlessly, however, the articles that truly touch us deeply are those from the bottom of a heart. If you ever encounter one passionate writer, please, please cherish him. You can always find an editor to edit articles. Discuss with favorite publishers about content ideas and keep their preferences in mind when writing new articles. A successful blog has its focus, its main theme, so it needs articles highly relevant to its theme. Be original. It’s actually my foremost tip, but I keep the best to the last time. Be original; it’s easy to say, difficult to do. But I love originality and I will strive for it my entire life whenever I have the opportunity to do so, to tell everyone if possible, please, please be original. In order to write an original article, you need to start from scratch, but never from “research”; you need to start from your own experiences, from your own memories, from your own notes, and from your own perspectives and then reach your own unique new insights. After that, you can research to verify facts in your memory. If you ever start an article from research, you can never be truly original. Your view is influenced by others first. You’re simply rewriting other’s views. It’s not that you cannot have similar views as others, rather, you should approach your articles originally. The approach should be original. What MBG user tips could you offer our audience? >> Use direct publishing, but use it wisely. My blogs receive directly published articles every day. I screen them and pick the ones that fit. Some of them are irrelevant so I have to decline. But some authors are really great at direct publishing the ones I want. I feel like they know me, know my blogs, and know my preferences; they directly publish to my blogs every day, and I accept their articles every day. When they’re in doubt, they will suggest articles to me instead. So add your favorite publishers, and directly publish to their blogs wisely. Ann Smarty also offers exclusive awesome content ideas to our premium users for free. I really hope everyone catches this precious opportunity! Awesome! I’ve watched these names coming along since the days when it seemed Ann was working 24+ hours a day on MBG. MBG is truly a value added site, not something I can say about every site. Ann, you are one amazing woman. And the team you have assembled is the most dedicated and helpful group I’ve ever seen. It’s an incredible experience, working alongside the likes of Ann Smarty and the My Blog Guest crew. Super Woman wouldn’t stand a chance against you. Thanks for the kind words, Kent! Deb, Don, you are amazing! I am so lucky to have you in the team! My Blog Guest has been an integral part of my guest blogging experience and so it is great to hear about how it started and see some stories from other users. The team do a great job so keep up the good work guys! Hah, great post thank you for the insight into the My Blog Guest world. I’ve been using the site for a few months now and it’s handy indeed! Great to see how you’ve all worked so hard and it’s all paid off – I think all the My Blog Guest users will appreciate that, no doubts. As for my super power – I think I’d go for Mammoth Memory; being able to remember absolutely everything. It would be very handy indeed! And actually, I could definitely use some great guest posts on my blog. Like many people around us, I am combining my blogging adventures with my full-time job. – My website (http://online-metrics.com) consists for half a year now. Is there any best practice regarding when to start with allowing guest posts on a blog? – Since I have started this website from my passion for SEO and Analytics, I feel I don’t want to lose a certain tone of voice. I am thinking about this in relation to accepting guest posts. How do you feel about this? – How to attract good, original quality posts is the last challenge for me. I know that in general there is a lot of “spam” out there. It looks like MBG is unique in that way, looks promising! Would be great to hear your comments. And of course, I will dive deeper in the material that is provided around MBG. Your website is excellent, Paul. Good work. One thing many publishers don’t understand is that they do not have to accept any post exactly as it is. If you find something with an appropriate topic, but you would rather the language is tweaked a bit, you can ask the writer to do that (or allow you to do that). I don’t remember ever being told (for articles I have requested to go on my own sites) not to change anything. For me, the norm is to edit and do some re-write before the work is ready to publish.